Fresh Baked bread: Baked today doesn’t mean fresh today! Enter a large Woolworths or Coles Supermarket, walk past the fresh fruit, the fresh cut flowers and you will come to the in-store bakery. Visit the Coles Bakery today and you will notice the signs have gone. What is the story? Fresh as in fresh food is becoming a key marketing battleground for supermarkets. Woolworths have used the slogan - The Fresh Food People - for years. 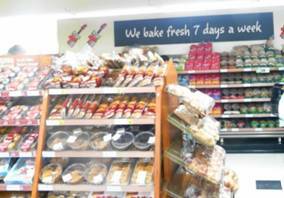 Coles decided to match this slogan and put up signs with 'Freshly Baked' and labels with 'Baked Today, Sold Today' and 'Freshly Baked In-Store' in the racks where bread, cakes and pastries were displayed for sale. So what is fresh? If you ask the staff at the in-store bakery “Is it fresh?” they reply "It arrived here ready to bake so you get it fresh!" This raises the question – What arrived at the store? Was it flour, water, yeast and salt, to make bread from scratch, which was then mixed, proved and baked? Or was it pre-mixed frozen dough, which was proved, moulded and baked in-store? Or was it pre-baked (par-baked) frozen product, which was thawed and re-baked in store? If it is par-baked product which was re-baked in store, is it wrong to call the bread fresh baked? The Australian Competition and Consumer Commission (the ACCC) is the consumer watchdog which enforces fair trading standards in Australia. It will prosecute companies and people who display misleading signs, labels and packaging. In June 2013, the ACCC took legal proceedings against Coles Supermarkets for breach of the Australian Consumer Law. The ACCC alleged that because the bread on display in the racks with the sign ‘Freshly Baked’ was a mix of breads - some baked from scratch, some baked from fresh dough, and some baked from frozen par-baked product, then the sign was false and misleading. Specifically, the par-baked bread could not be called fresh baked. In June 2014, the Federal Court agreed with the ACCC that bread baked from frozen par-baked products sourced from as far away as Ireland could not be described as freshly baked, nor as freshly baked in-store. As a result, in September 2014, the Federal Court banned Coles for 3 years from advertising the sale of par-baked bread in this way. Coles has removed its ‘We bake fresh 7 days a week’ signs from its stores. 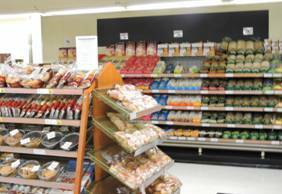 Coles was ordered to display a Notice headed 'An important message from Coles Supermarkets Australia Pty Ltd' at all point of sale counters in its in-store bakeries for 90 days. You will see in the ‘After’ photo the blank space on the wall where the sign used to be, and the Notice on top of the rack display. Check it out next time you visit Coles. And worse is to come for Coles. The Federal Court will hold a special hearing to determine the penalty Coles must pay for breaching the Australian Consumer Law. Some idea of how much the penalty might be is the penalty of $300,000 ordered by the Federal Court for misleadingly labelling chicken meat packaging. The label stated the chickens were ‘free to roam in large barns’ when in fact they ‘could not move more than a metre or so (at most) without having their further movement obstructed by a barrier of clustered birds’. What other produce could the ACCC pursue for being misleadingly labelled as ‘fresh’? Apples, bananas and other fruit which are sold as ‘fresh’ even though they have been kept in cold storage for up to a year? Prawns and fish sold as ‘fresh’ which have been frozen? Beer bottle labels: Where was the beer brewed? Labels on beer bottles and beer cans must show the place where the beer was brewed by law. But what if the name of the beer is a place name – such as Byron Bay Lager? Is it misleading to the public to emphasise the brand name in big print on the front label, while playing down the place where it was brewed elsewhere in the small print on the back label? Carlton and United Breweries brew a beer called Byron Bay Pale Lager. The labels on the bottle show a strong connection with Byron Bay – the name, the map, the lighthouse and the description: We’re housed in a historic location, a birthplace of much of the fame and spirit of Byron Bay. Does it matter that the beer was brewed in Warnervale on the NSW Central Coast (630 kms south of Byron Bay)? 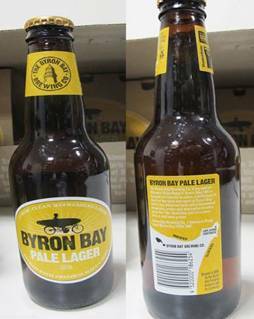 The ACCC alleged that it does matter - the labels were false and misleading because they gave the beer drinking public the impression that the beer was brewed by a small brewery at Byron Bay. CUB decided, for commercial reasons, to not fight the ACCC’s allegations in court. They provided the ACCC with an undertaking to not make the false or misleading representations as to the where the beer was made. CUB also paid two infringement notices of $20,400 and published corrective advertising. August 2010 – Click on the Property Law tab to find out how to deal with the pesky trees that your neighbour is growing! Read about the new rights you have to have the trees trimmed if they form a high hedge and block your view or your sunlight!